Size of Male: 45-70 lbs., 17-20 in. Size of Female: 45-70 lbs., 17-20 in. The Chow Chow is a head turner. Take a close look at the furry pooch, and you’re likely to see some semblances of a lion or a teddy bear. Its fur can either be smooth or rough. This ancient and dignified breed is popular for its eerie blue-black tongue and characteristic scowl. 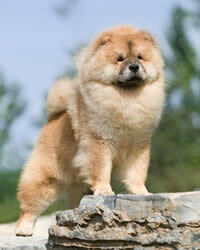 Chow Chows exhibit some of the characteristics of a Spitz. You will find a glimpse of the ancient breed in Chinese sculpted and potted works that date back to the Han Dynasty. There are also records which point to Mongolia and Manchuria, where these dogs were reportedly bred for their meat and their pelt! The pooch is by no means an underdog. In fact, it’s often associated with the Chinese nobility and elites who used the dogs as hunting assistants and companions. The pleasant ring of their name portrays the curiosity and fascination of its 17th-century English fans. You will catch glimpses of catty behavior in this dog breed. It is independent, willful, dignified and a bit lazy. It chooses whom to bond with and may get very protective. It tends to resist instruction but tempers this obstinacy with polite behavior. Reserved with strangers and not so friendly with other animals, this medium sized dog breed is no dog for the novice pet owner or for the playful young master. Living Environment – The breed doesn’t take warm temperatures and is better suited to indoor living. Make sure your place has adequate cooling facilities as well as an on-hand vacuum cleaner. If you have a yard, keep it fenced. This dog breed’s predatory instincts can spell trouble for you and your neighbors. Grooming – Ask yourself if you’re really up for it. Raising this heavy shedder means including regular vacuuming and pooch grooming as part of your daily schedule. Coat care needs will depend on the kind of coat your pet has. For the rough-haired variety, brushing once in every 2 days is a must while weekly combing is recommended for the smooth-haired variety. You may have to step up the frequency during shedding periods. Diet & Exercise – Unlike many canines’ high-protein fare, these dogs should have lower protein content. They are prone to dog allergies that may be triggered by meat as well as commercial food ingredients. Dietary staples for your pet will simply include rice, some fish, fats, fiber and cheese. Occasional chicken and veggie bits are fine. The ancient breed was a hunting dog. Ironically today, the breed is a lazy one ? quick to doze off after a full meal! As a pet owner, you must enforce the dog’s exercise routine at a daily level to prevent weight gain that could trigger canine hip dysplasia. Short play times scheduled throughout the day, or leisurely walks early in the morning and in the evening are suggested. Health – Sensitivity to warm temperatures, anesthesia and food allergens are common in this dog breed. In addition, these dogs exhibit potential for a host of other health complications such as cataracts, gastric torsion, and elbow and hip dysplasia. Many vets will advise you to have your pet undergo hip, eye and elbow exams. Easy to housebreak but challenging to train, the Chow Chow performs only the tasks that it likes. Early socialization as well as extensive and consistent basic dog obedience training sessions are crucial for this breed. Heavy-handed methods will exacerbate the Chow Chow’s stubbornness and will evoke retaliatory snaps. With the right trainor, the breed excels as a well disciplined watch dog and family protector.